Can you identify any of the people in this photo? 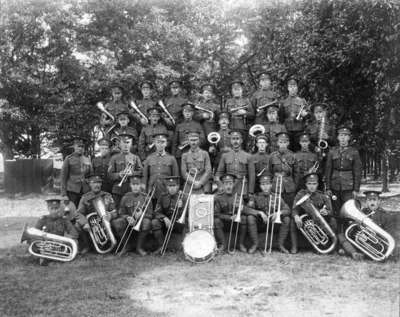 A black and white group portrait photograph of members of the 182nd Battalion Band. This photograph can be found at pg. 15 of "The Ontario Regiment, R.C.A.C. 125 Years" by the Robert McLaughlin Gallery. According to the description in this book, the photo is c.1916 and "The 182nd was the second battalion to be raised in ontario County, the first being the 116th Battalion. The 182nd Battalion went to Europe in 1917 and was subsequently broken up to provide reinforcements for battalions that had suffered heavy losses at Vimy Ridge. None of these bandsmen has been identified." 182nd Battalion Band, c.1916, Photographer Unknown. Whitby Archives 29-002-022. Scanned from an original photograph.